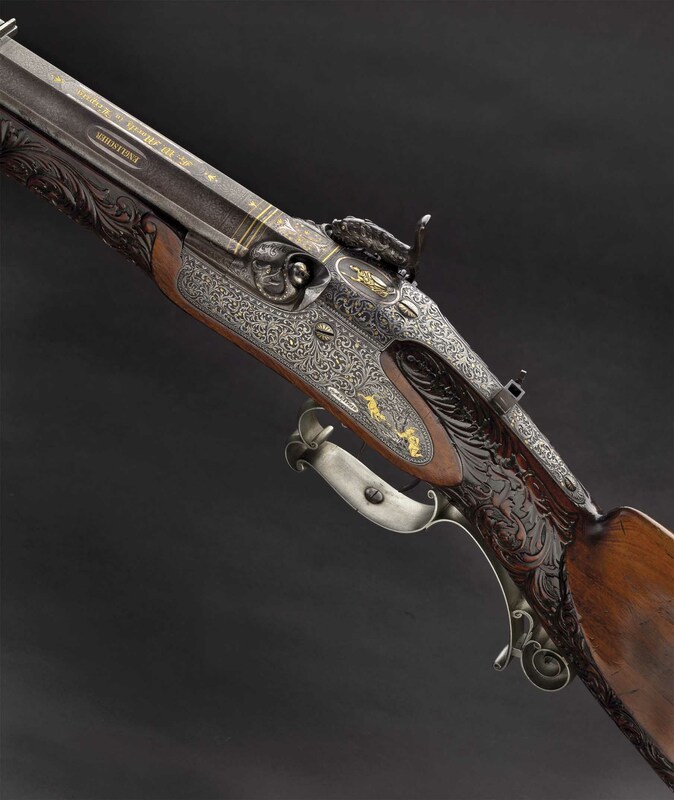 The Moritz family has a long history of gunmaking dating back to the 17th Century. A website titled Stammbaumingrid.re-koeln.de contains a lot of information pertaining to the Moritz and Anschutz families part of which is included here. Eugéne Heer’s monumental book Der Neue Støckel records the earliest gunmaking Moritz being Heinrich of Kassel in Hesse. He lived from 1615 to 1668 and came from Medebach in Westfalen. He was residing on Ziegengasse (Goat Lane) in Kassel by 1642 and married a widow named Schuchard in 1657. He was the father of the following Moritz. Moritz (first name unknown) of Kassel, Hesse (is assumed to be the son of Heinrich Moritz) worked approximetely 1680 to 1700. Made firearms for the Dukes of Brunswick and imported high grade Walnut stock wood from Grenoble. He may have been the father of Johann Ernst Moritz. Johann Ernst Moritz is one of eleven branches (branch 3 on the Stammbaum der familie Schoebel web site) of the Moritz family found in the late 17th and 18th Centuries. Of the first generation of those eleven branches five are known gun makers or workers. Johann Ernst Moritz (branch 3 generation 1)was born around 1720 and by 1741 he was in Zella St. Blasii when he married Elisabetha Regina Reßler on sept. 22 of that year. they had four children the youngest and only son being Johann Valentin Moritz. Johann Valentin Moritz (branch 3 generation 2)was born on March 14, 1751 in Zella St. Blasii to Johann Ernst and Elisabetha Regina Moritz. He married Maria Barbara Schramm on Nov. 11, 1777 in Zella St. Blasii and they had 5 children, the oldest being a son, Johann Christian Moritz. He passed away on Nov. 17, 1815. Examples of his work may be those shown in the following images. He was a note Gun maker and Graveur. 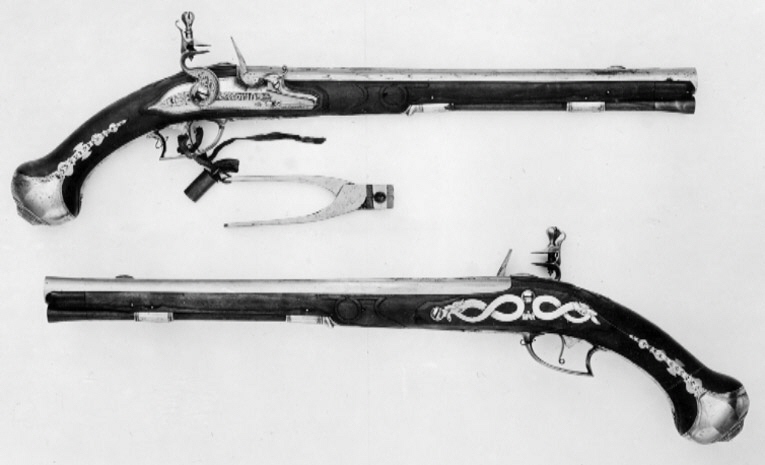 A pair of flintlock pistols attributed to Johann Valentin Moritz. 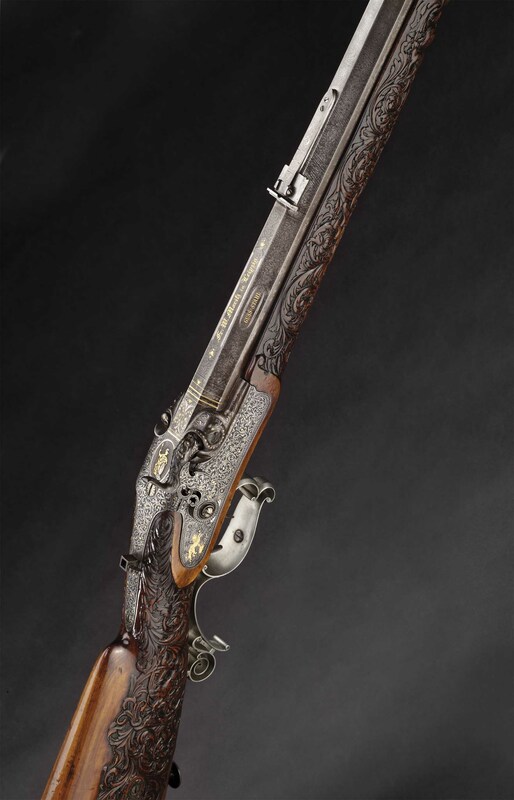 A flintlock long gun attributed to Johann Valentin Moritz. Johann Christian Moritz (branch 3 generation 3) was born on April 29, 1784 to Johann Valentin and Elisabetha Moritz. On Sept. 21, 1817 he married Susanna Ursula Recknagel who was born about 1795. They had two children- Valentin Ernst (1820) and Christian Nicolaus (1822). Johann Christian passed away on July 3, 1837 in Zella St. Blasii. He was a noted Gun Stock maker and perhaps a total gun maker who specialized in stockmaking. Johannes Moritz (Moriz)- In Kassel working 1663-1707. His occupation of Hofbüchsenmacher was recorded at the birth of a daughter in 1678. Wilhelm Moritz (Morits, Moriz) – In Kassel, Hessen ca: 1680-1704. The first generation of another branch of the Moritz family (branch 7) was Johann Siegmund Moritz who was the older brother of Johann Ernst Moritz previously mentioned. Johann Siegmund was born on Dec. 13, 1721 in Zella St. Blasii and on Nov. 15, 1745 he married Annen Catharina Menz. He passed away on May 6, 1798. They had six children three of which were sons- Christian Jacob (1746-1824), Joh. Valentin Moritz (1752- ) and Johann Ernst (1760-1822). 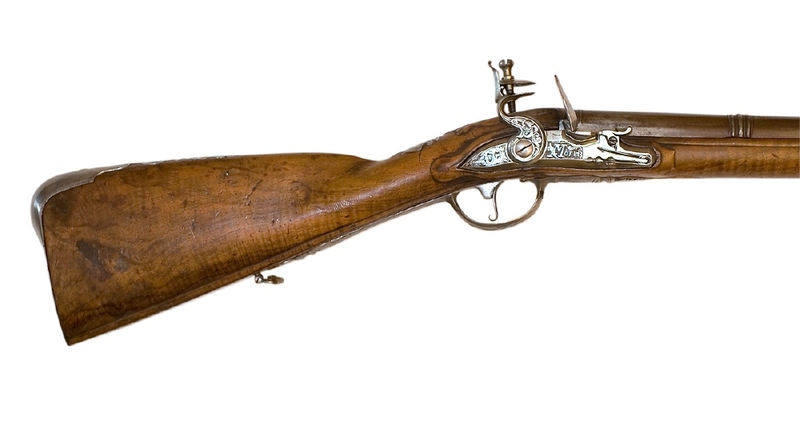 Christian Jacob and Johann Ernst both followed their father in his profession as a gun maker. Johann Siegmund was recognized as a fine büchsenmacher and Graveur. Christian Jacob Moritz (branch 7, generation 2) was born on Sept. 13, 1746 in Zella St. Blasii and died on Sept. 13, 1824 in Zella st. Blasii. He married twice, to Anna Maria Moritzin and Susanna Barbara König. Christian Jacob had six children. His one son Johann Daniel (1776-1855) followed him as a gunmaker. In 1824 at the time of his death Christian Jacob was recognized as a Büchsenmachermeister and Graveur. Johann Ernst Moritz (branch 7 generation 2) was born on May 11, 1760 In Zella St. Blasii and died there on Dec. 27, 1822. He married Anna Margaretha Fischer about 1790 and they had one daughter. He was a graveur following in his father’s footsteps. Johann Daniel Moritz (branch 7, generation 3) was born in Zella St. Blasii on Jan. 17, 1776 and died in Leipzig on dec. 19, 1855. He married Johanna Carolina Schmidt in Leipzig on July 10, 1809. They had nine children three of which were sons. 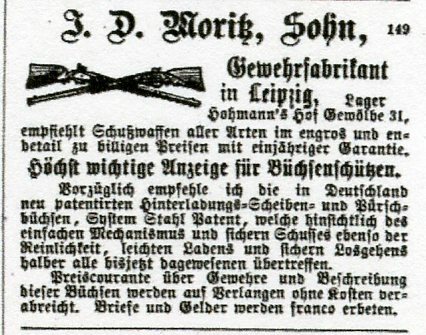 Johann Daniel was a Journeyman Gun Maker in 1805 and founded his own business J. D. Moritz Sohn in 1813. The second son Friedrich Wilhelm Moritz carried on his fathers business. 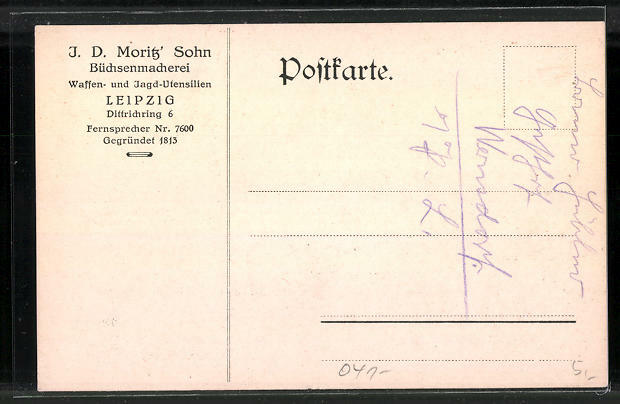 I. D. Moritz & Sohn– Leipzig, ca:1850. (Or is this J. D. Moritz?) This gun maker’s initials has caused a controversy of sorts. 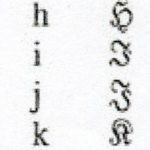 Some experts say it is J. D. while others contend that it is I. D. I submitt a portion of a Germanic Alphabet Chart showing both the letters I and J in both Modern and the old Fractur styles for comparison. The advertisement below from the Leipziger Zeitung of 1853 shows the name in old Fractur. I will let the viewer decide which initial it is. 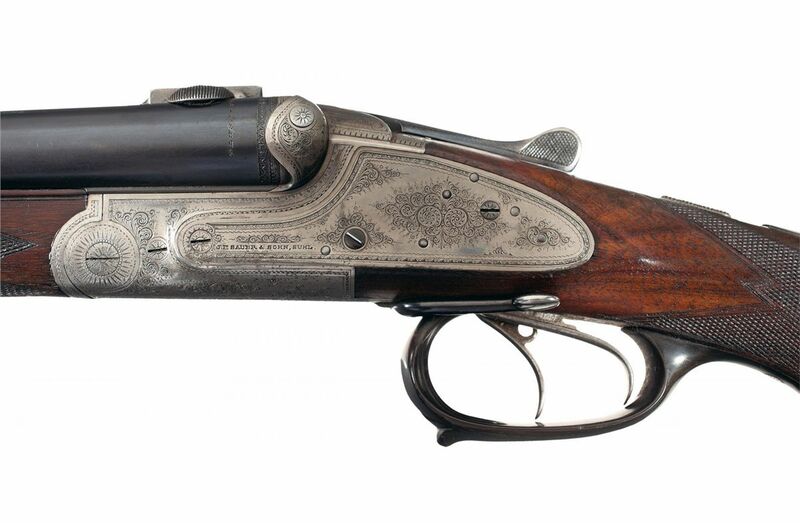 A shotgun sold by J. D. Motiz Sohn and made by J. P. Sauer & Sohn which will be pictured later shows the first Initial as a “J”. An advertisement from 1865 in Modern Alphabet clearly shows the first initial s an “I”. Thanks to Volume 2 of the 1873 Handbook of Industry printed in Leipzig we have the answer to the controversy. It states that the firm was founded in 1815 by Joh. David Moritz and after 1873 was operated by Friedrich Wilhelm Moritz. The web site www.stammbaumingrid.re-koeln.de gives his name as Johann Daniel Moritz and several advertisements from the 1850’s give a founding date of the firm as 1813. Friedrich Wilhelm Moritz, (branch 7, generation 4) the son of Johann Daniel and Johanna Carolina Moritz was born in Leipzig on Oct. 7, 1815 and died on Dec. 12, 1878. He married Johanna Friederika Kaiser in 1850. They had five children. He was a successful gunmaker and carried on his fathers business after his retirement and death. Two of his sons followed in the trade- Friedrich Gustav Traugott Robert Moritz (1851-1908) and Friedrich Wilhelm Bernhard Moritz (1858-1906). A photo gallery of guns made or sold by J. D. Moritz, his son Freidrich Wilhelm or their descendents who carried on the business. 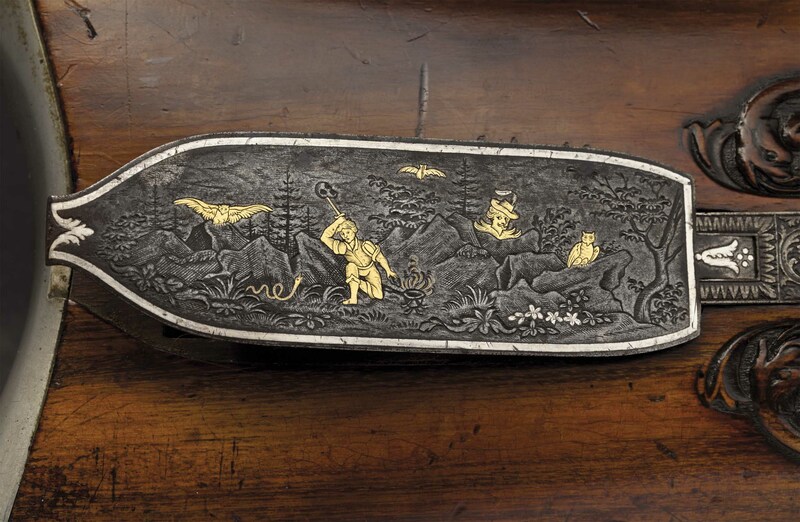 The following images are courtesy of Hermann Historica Auctions in Munich, Germany. They are of a heavy large bore percussion target rifle sold by then on April 29, 2015 as lot no. 344. It was made and sold by Friedrich Wilhelm Moritz and is 16mm calber. 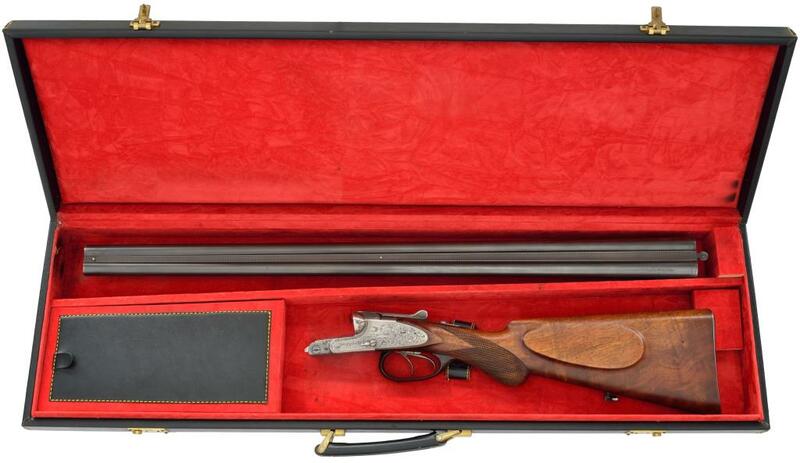 Below is an Air Rifle made and sold by Fr. w. Moritz. The following two images are courtesy of Rock Island Auction Co. and was sold by them on June 26, 2015. It is a 28 ga. and .54 caliber percussion combination (Büchsflinten) gun with 29 inch barrels. Marked I.D.Moritz on the barrels. The image below is also courtesy of Rock Island Auction Co. and is a 16 ga. outside hammer shotgun with 26 inch barrels engraved “J. D. Moritz- Sohn”. 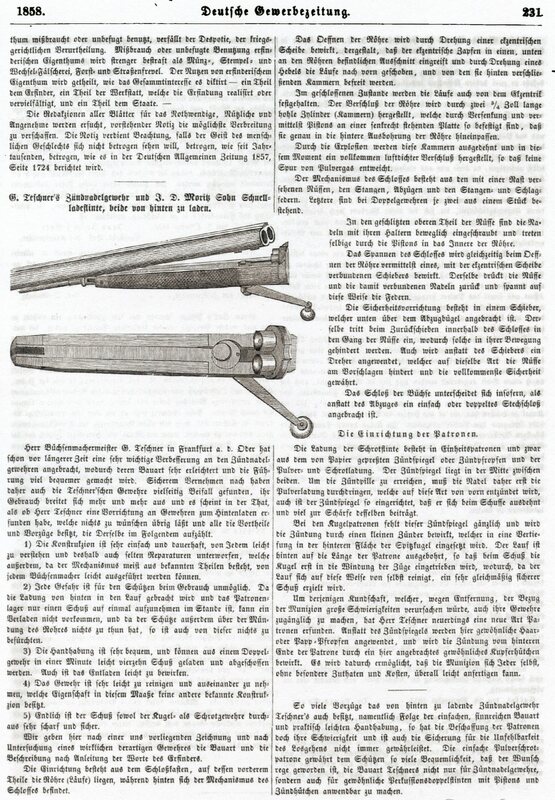 Below are six views of a single shot side lock Pirschbüchsen made by J. P. Sauer & Sohn and sold by I. D. Moritz Sohn. The images are courtesy of the James D. Julia Auction Co. The rifle is chambered for the 11 x 56R. It has a 26 5/8 inch barrel and is serial no. 715G. The following two images are courtesy of the Rock island Auction Co. and are of a Drilling sold by them on Set. 7, 2012. It is 16 ga. and 9mm caliber, marked “J. P. Sauer & Sohn” on the barrels and the locks and the rib is engraved “J. D. Moritz Sohn, Leipzig”. It is serial no. 158425. 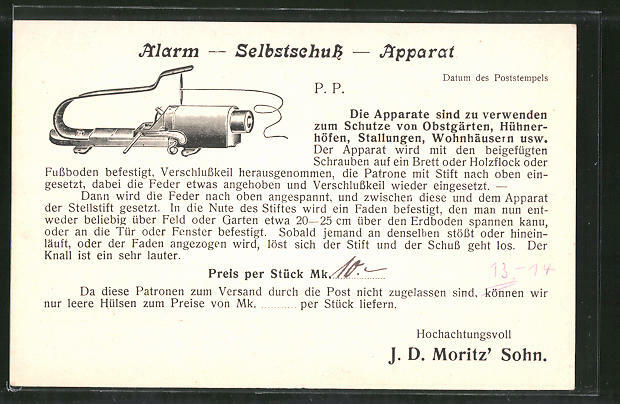 Below is a Post Card advertising an Alarm device made and sold by J.D.Moritz’ Sohn. Friedrich Gustav Traugott Robert Moritz (branch 7 generation 5) was born on Jan. 26, 1851 in Leipzig and died there on Dec. 6, 1908. He was a büchsenmachermeister and operated the Moritz gun factory presumably in partnership with his brother Friedrich Wilhelm Bernhard Moritz. He had one known son- Gustav Walter Moritz (1884- ) (branch 7 generation 6) who was also a gun maker. Friedrich Wilhelm Bernhard Moritz (branch 7 generation 5) was born on March 23, 1858 in Leipzig and died there on Jan. 25, 1906. He is listed as a Büchsenmachermeister and a partner in a gun factory presumably with his brother mentioned above. Johann Jacob Moritz (Branch 6, generation 1) was born about 1720 in Zella St. Blasii and married Sabina Elisabeth Kell in 1743. They had 3 children, two being sons. He is recorded as being a Büchsenmacher. It is unknown if any of his sons followed in that line of work. Johann Jacob Ernst Moritz ( Branch 2, generation 1) was born in Zella st. Blasii about 1710 and on Jan. 15, 1737 married Margaret Elisabeth Schaller. they had three children, two daughters and one son. He is recorded as being a Büchsenmacher. It is inknown whether his son followed in his fathers profession. Volume 2 of the three volume set of books titled Alt Scheibenwaffen by Jesse Thompson, Tom Rowe, C. Ron Dillon, Allen Hallock and Bill Loos includes a Directory of Makers & Tradesmen which was compiled by Jesse Thompson. The following entries are found for Moritz and are included here courtesy of Mr. Tom Rowe. Moritz, Christian August– A Meister gunmaker in Zella st. Blasii prior to 1900. 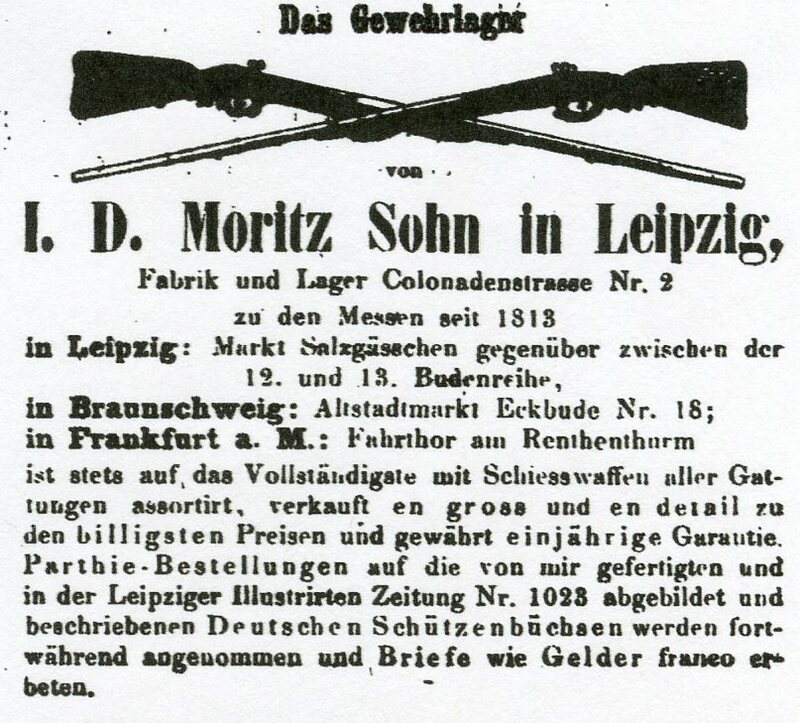 Moritz, Heinrich– (trade name-Hei-Mo)- Gunmakers and gunstock wood dealers. Heinrich Moritz-Gewehrfabrik u. Schaftholzhandling Zella-Mehlis Spezialität: Bayerische Zimmerstutzen. Located at Albrechtserweg 3 the firm made the Hei-Mo target pistol, the system Lang (Warnant) target pistol, system Aydt Scheibenbüchsen with interchangable normal caliber, small bore and Zimmerstutzen barrels, Bayerische Zimmerstutzen as well as various hunting and sporting guns. The firm seems to have ceased active operation after 1936. Note: there was a Meister gunmaker named Kaspar Heinrich Moritz in Zella St. Blasii circa 1886 who may be this Heinrich Moritz or related to him. Click Here to view a Heinrich Moritz catalog. Moritz, Wilhelm– Gunmaker at Gothaerstrasse 6, Zella St. Blasii 1912 and later at Heinrich-Ehrhardtstrasse 6. Born Feb. 6, 1870 and died March 28, 1923. It is believed that he only made hunting guns. The firm continued to operate up to circa 1929. Moritz, Wilhelm August– A meister gunmaker in Zella St. Blasii pre-1900. Moritz & Gerstenberger– (trade name-EM-GE)- Makers and dealers in guns and shooting equipment with their head office at Brückenstrasse 54, Chemnitz and production in Zella-Mehlis at Malzhügel 1. In 1927 they advertised alarm pistols, powder measures and air gun targets. In 1929 Albin Gerstenberger was in charge of the EM-GE facility in Zella Mehlis. In the 1940’s they were advertising single shot and repeating air rifles and pistols with excellent performance. Following are period advertisements found in various 19th Century periodicals. 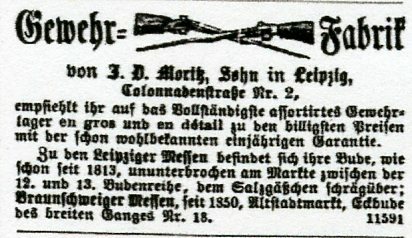 An advertisement from the Leipziger Zeitung of Sept. 1856. It clearly states that they had a store and or shop in Zella also and some relationship with the Moritz’ of Zella. 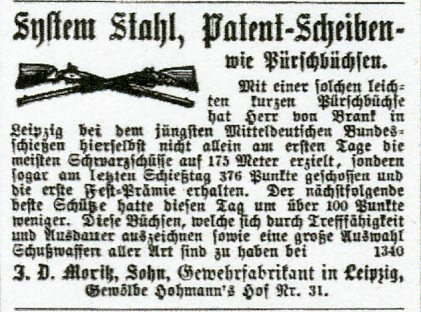 The following article found in the 1858 edition of the Deutsche Gewerbezeitung shows that J. D. Moritz Sohn was making side by side breech loading shotguns on Teschners design and action. 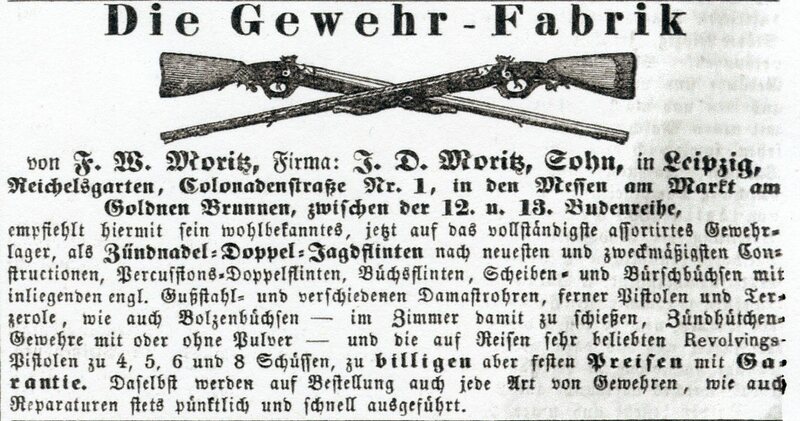 An advertisement found in the Illustriate Gewerbezeitung of 1865 which shows their factory and store located at Nr. 2 Colonadenstrasse and states that it started in 1813. 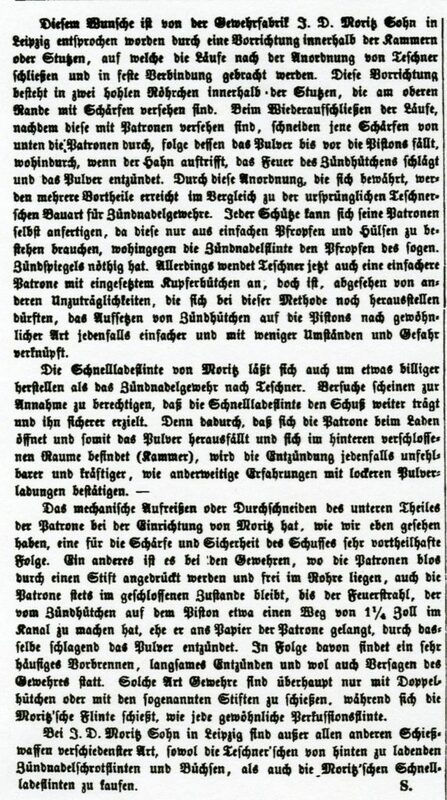 It also shows that they had stores in Braunschweig and Frankfort a. M.
An advertisement found in the Illustrirte Zeitung of July 18, 1869 which gives a founding date of 1813 and also states that their location in Braunschweig was opened in 1850.